Until a few years ago my entire experience with talking circles consisted of one trip to a horrible Al-Anon group and the understanding that there was a form of group therapy where everyone sat in a circle. Amazing how my perspective and experience have changed as a result of hosting Red Tent Temple, the Illuminated Priestess Path and facilitating girl’s empowerment circles. The talking circle is one of the most powerful elements in any woman’s group or group process. As a Reiki Master and cranial-sacral therapist, I have worked with a large number of women as a healer. I cannot remember a single woman over the age of 10 who was not weak or stuck in her throat chakra. The world we live in teaches us to shut down our voices because speaking out, for women and older girls, is not considered appropriate. Positive aggression (as in going after what you want), forcefulness and authority–all considered redeeming qualities in males–are frowned upon qualities in females. This scenario is not helpful to men and it robs them of all sorts of wonderful things, however it is a crime against womanity. It’s time to take this kind of sexism and toss it onto the fire. In a talking circle women have the opportunity to talk about what’s up for them, to share their stories, their pain, their anger. A woman might shout, cry, whimper or rage. 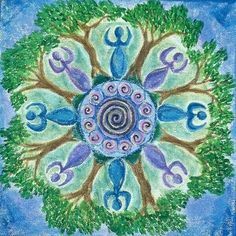 The power comes from the knowledge that she will be held, that her circle sisters will listen with deep empathy, love and will hold her in safety and compassion. For the girls in my circles we rely on rules to guide them. Some of our rules are: this is safe space; no shaming; no negative self-talk; no sharing other people’s stories outside the circle. Over the two years I’ve been facilitating a particular circle of young women, I have seen amazing changes in the way they interact with each other and also in the way they have pushed their edges during talking circle. They have come to a point where they feel safe enough to share with an incredible depth about what is going on in their lives, their minds, and their hearts. I see vulnerability, honesty and love radiating in this powerful group of young women. I often use a timer during talking circle. Our gatherings last for 3 hours and so we have a limited amount of time allotted to every activity we do. If, however, a young woman is processing something big, I do not allow the timer to go off. It would be damaging to have a loud beep in the midst of a story about how her favorite Uncle died in a car crash or when she is telling us that she is bulimic and needs help. Times like these, they can have all of the time they need. If you are facilitating empowerment circles for girls or women, a talking circle is an important component. We learn empathetic listening skills, how to hold space for our circle sisters and also that we have a voice to raise in this world. It’s time for change and this is one way it is happening, all over the country, all over the world.